Anyone who has ever been in charge of organising a stag party for the groom can tell you that the pressure can rival that of walking down the aisle. Deciding where and how to give your best mate a royal send-off and making the most of his final days of freedom is the hardest part of organising a stag party. That’s why paintball has always been a hugely popular activity for stag parties as it leaves the groom exhausted, bruised and battered which makes it good training for marriage! This article will hopefully show you how to make sure your stag’s paintball party goes smoothly. Speak to The Paintballing Company Before You Book – It’s always good to do your research before you book a stag paintballing event for a number of reasons. If you party is not that big the paintballing company may split up your group and make you play with other players, meaning you all don’t get to play against each other. If you plan to dress the stag up in any kind of ridiculous outfit, make sure you OK it with the paintball centre first as some centre managers may be hesitant to let you wear anything other than what they provide. However, at Delta Force we encourage our stag parties to wear whatever outfits they want and we can even provide some ourselves! Get a Quote – Organising a paintballing stag party can be quite expensive when booked with some providers. The best way to ensure you get the best paintball experience money can buy at the most competitive price is to book with Delta Force Paintball – We have had a lot of experience in catering for stag parties and our booking staff can tailor a day of paintball to suit the needs of your party and we can ensure that you have the best day out possible. Make Sure You Buy Your Paintball’s In Advance – When you are in the heat of a paintball game in the middle of a face off with the opposition, sometimes all sense of ammunition conservation goes out of the window. We have all been there before and there’s nothing worse than running out of ammo in the middle of the game, especially when the enemy find out that your running empty! It’s always best to make sure that you have plenty of paintballs, especially for our famous ‘stag hunt’! If you follow these three steps above then you should have no problem booking a great day of paintball for your stag party. 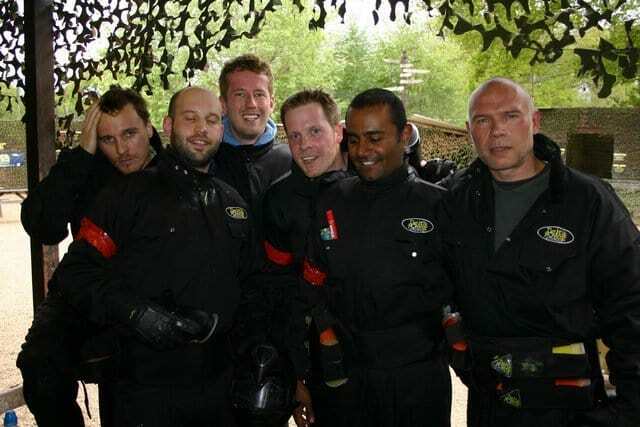 Delta Force has had over 22 years experience at the forefront of the UK paintball industry and in that time we have hosted countless thousands successful of stag parties. If you want to organise your paintball event with Delta Force then please give our booking office a call on 0203 869 9301 – our friendly booking staff are standing by ready to take your call.